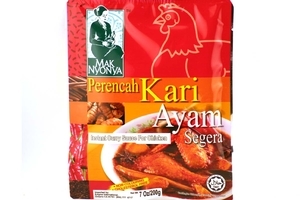 Mak Nyonya Instant Chicken Curry Sauce Mix (Perencah Kari Ayam Segera) in 7oz (200g) sachet. Maknyonya is proud to present, a simplicity in cooking, an easy to present, convenient, tasty as well as delicious in collections of Nyonya sauces. It is the most relaxing way to preparing an easy-to-cook Nyonya delicacy to fill up your family members under the warm environment to enjoy a flavored unique Nyonya food. Product of Malaysia. The Nyonya delicacy. Back to my ancestors, the secret recipes of Nyonya foods has been a unique culture and has been handed down over the generations. There is no simplicity to preparing a warmth and delicious Nyonya food without its original flavors and from preferring the most superior food materials and spices with the best quality in its class.